For Longer Eyelashes Naturally.. Learn How To Use Latisse Today!! Highly Rated, Northern Virginia’s Affordable Radiance Fairfax Medspa also would love to save you money! Save on your next purchase of Latisse! Please visit our Brilliant Distinctions page to earn discounts and rewards. You can also use your membership to save on BOTOX, Juvederm®, Latisse, Voluma, Illuminize Peel, Vitalize Peel and Skin Medica Skin Care Products. Do You Want Longer Eyelashes…??? Beautiful long eyelashes have always been highly desired by women. Long eyelashes create a warm, feminine quality that warms and enhances the beauty of the eyes. For years, a variety of mascara products have been put on the market to create this attractive look. Latisse, the eyelash growth solution is specifically indicated to promote eyelash growth continues to give mascara a run for its money. 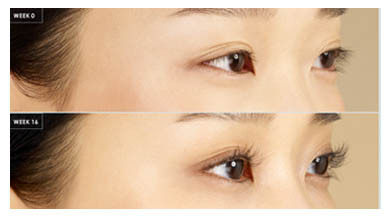 By now, everyone has heard something about Latisse, the natural eyelash growing solution. Latisse has getting a lot of attention for their proven, effective treatment to help you grow thicker, longer, more beautiful eyelashes.. Latisse is the first FDA approved product that is specifically indicated to promote eyelash growth. Brought to you by the pharmaceutical company - Allergan (they also make Botox, Juvederm, Voluma and Skin Medica). According to Allergan, Latisse users can expect to experience longer, fuller, and darker eyelashes in as little as eight weeks, with full results in 16 weeks." Please note: once you stop using Latisse, your eyelashes will slowly return to their pre-treatment appearance. IT'S TIME TO THROW OUT THE MASCARA! NO MORE FALSE EYELASHES!! Look and Feel Beautiful At Radiance Fairfax Medspa of Northern Virgina. Most women look for ways to feel more attractive or younger. One of the best ways to accomplish this goal is to enhance your eyes. After all, this is the part of your face that people notice during conversation, glances and pictures. With Latisse, when you increase your eyelash thickness, lengthen, and enhance the appearance, it can be combined with Botox, which reduces the appearance of wrinkles around the eyes. Another very complimentary cosmetic procedure is the use of a Juvederm to correct the hollows beneath the lower eyelid region. These are all simple methods in which Latisse can be paired together to enhance the natural beauty of your eyes. Have you heard about our Non-Surgical Madonna Eye Lift? Or Our A+ Liquid Face Lift? WITH JUST A FEW CONSISTENT STEPS, YOU CAN HAVE BEAUTIFUL LASHES! Like every routine, applying Latisse is all about consistency and precision. Once you follow these basic guidelines, your results will come gradually over time. To see the full effect of your eyelash transformation, take a #SELFIE - before picture when you start your eyelash treatment and keep taking pictures every two weeks to see your long lash progress. 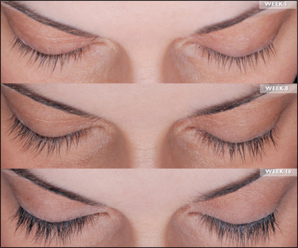 Try Our Eyelash Growth Enhancer - Latisse . The FDA-approved prescription solution to help you grow longer, thicker natural eyelashes. With patience and following the directions, you can expect to grow beautiful natural eyelashes that are longer, darker and thicker. As Latisse works gradually, with noticeable improvements after four weeks, you will see the best results after 16 weeks of daily application of the Latisse solution. By the 16th week, most women saw significant increases in eyelash length, fullness and darkness, according to a clinical study. It's important to remember that Latisse must be applied every day for the best results.